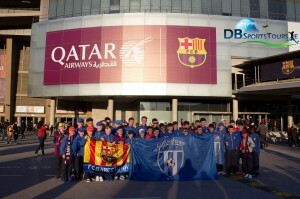 Over Easter Collinstown under-14’s enjoyed a trip to Spain to the luxurious Futbol Salou and Cambrilis Park facility. In association with DB Sports Tours, the Collinstown outfit spent five days on the trip playing a series of friendlies and undertaking several elite training sessions. The trip began early on Monday April 6th as the group left Dublin airport and headed to Reus Airport, situated by the city of Reus and approximately 7.5 km from the city of Tarragona, in Catalonia, Spain. The first day the group had a self-organised training session in the evening before beginning the trip properly on Tuesday. The group headed to the Futbol Salou Sports Complex on Tuesday morning for a special training session, titled Masterclass, by a Spanish Pro Licence Coach. Later that evening the group departed the Futbol Salou Sports Compex and took part in their first friendly match against Cambrils A at the CambrilsPark. The next day the group travelled to Barcelona, wherein first they visited the RCD Stadium and then to a local shopping centre before some free time to spend around the city. The group then left for the famous Camp Nou stadium, where they got to watch Barcelona take on Almeria, in which La Blaugrana won 4-0, thanks to a brace from Luis Suarez, Lionel Messi and Marc Bartra. The following day, Thursday 9th of April, began with another Masterclass training session with a Spanish Pro Licence Coach at Futbol Salou, before departing for their second friendly match of the trip. Facing Ruidoms A the group were said to have gained much experience from the game against such high quality opposition. The next day the group departed for Dublin following a memorable trip. For more information on such trips keep an eye on the blog here.